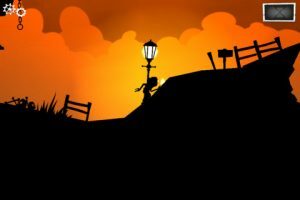 If I could rate Oscura ($1.99 – limited-time reduced price) based purely on its graphical prowess, the platformer would get a 10. The silhouetted foreground is a flood of black with twinges of red, standing out boldly in front of the colourful sky. It looks brilliant. I rate the audio similarly highly, atmospherically buzzing along throughout the action, the music mysteriously clambering across a wide note range whilst enemies eerily gabble up and down in the air. Sadly, I have to consider functional things like the controls as well, and they don’t fare so well. To move left or right, you touch the appropriate side of the screen. Jumping requires touching both sides of the screen at once. This system is fairly intuitive, but it’s also a little sluggish, and makes it difficult to move the character precisely. It feels like it’s been implemented as a means of reducing the amount of clutter on-screen, which it definitely succeeds at, just at the cost of complete functionality. The controls are by no means unusable, they could just be a lot more reactive. A lot of the jumping between platforms, or swinging lantern-like pendants, or over deadly spikes, requires fairly precise landing, and it’s just not easy enough with these controls. The game length is also a sad dampener on the game’s high production values. There are only seven stages, with more on the way in a future update. The game thus takes a mere 40 minutes or so to complete, and though there are collectables and hidden areas throughout the stages, the only-slightly-above-average level design prevented me from wanting to replay levels. Still, the game is fun while it lasts. To ensure that it stands out a little from the crowd, it includes a time-slowing mechanic that involves collecting shards to build up a reserve of time-slowing abilities. Swiping across the screen activates the time-slowing mode, making your character’s surroundings slow down but his actions continuing at the same speed. The ability helps you make your way around the more difficult sections of the game, but is unfortunately flawed in its implementation. If you die having used up your reserve of the ability, you will be taken back to the most recent checkpoint, but the amount of the ability that you had when you passed the checkpoint is not restored. That means that you can end up at a checkpoint just before a really difficult to pass obstacle without the time-slowing ability that could help you pass the obstacle. Ultimately, Oscura is a pretty, good platformer, but not a great one. Its inaccurate controls, unimaginative stage design and flawed time-slowing mechanic stand in the way of its potential brilliance. Since I first reviewed Oscura, Chocolate Liberation Front have addressed many of its original faults via an update. Firstly, they’ve tweaked the controls so that they’re slightly more responsive – still not perfect, but closer to it. Their occasional sluggishness is now more down to the character moving quite slowly than the controls not picking up player input quickly enough. Even better, they’ve added a more traditional button-style control method, with directional buttons on the bottom left of the screen and jumping and time-slow buttons on the bottom right. They’re far more precise to use than the original control style, although the buttons are a tad small, which could make them difficult to use for those with large fingers (well, I have tiny fingers, so maybe ‘normal-sized fingers’ is more appropriate here). The inclusion of a time-slow button seems nonsensical, given that swiping on the screen to activate time-slow worked perfectly well before, and getting rid of the button would mean that the jump button could be made larger. In fact, the jump button could be done away with too, with tapping on the right of the screen making the character jump. The new controls still aren’t perfect, then, but they’re a definite improvement. To minimise frustration with the time-slowing mechanic, the developers have placed more shards near to checkpoints, so if you respawn at a checkpoint having used up all of your shard juice, you can refill it fairly easily. It makes dying less frustrating, increasing the fairness of the game. Similarly, there seem to be more checkpoints in the early levels, so you won’t have to tackle the same challenging obstacle twice. To round off the update, Chocolate Liberation Front have increased the number of levels to twelve, with the new levels longer and better designed than the first seven. Of course, this increased amount of content reflects far better value than that provided in the original game. To reflect the improvements brought about by this update, I’ve upped the game’s rating from 70 to 80.